8:08- The Blackhawks have re-signed Bryan Bickell to a four-year extension worth $16 Million. 8:03- The 3rd round flew by. No big news to report. Caps’ next pick is in the 5th round. 7:30- The Third Round has begun. 7:29- The Capitals select Zachary Sanford who is headed to Boston College. He was projected to be available in the 3rd round. No reason to trade 3 picks to grab him in the 2nd round. Once again a terrible decision by George McPhee and the Capitals front office. 7:27- Winnipeg trades pick 61 to the Capitals for picks 84, 114 and 127. 7:17- TRADE– Chicago trades Michael Frolik to Winnipeg for 3rd and 5th round picks. 7:08- The Capitals select Defenseman Madison Bowey from Kelowna of the WHL. This is the Caps’ second round pick and 53rd overall. 7:00- REPORT– Sources say that the Oilers and Flyers are in trade talks with Braydon Coburn being the centerpiece of the deal. 6:44- New Jersey makes their 1st pick, 3 hours and 44 minutes into the 2013 NHL Draft. 6:41- TRADE– Chicago trades David Bolland to Toronto for three draft picks. 6:27- Fucale Watch: Zack Fucale goes to Montreal. 36th overall. 6:21- TRADE– Carolina trades Jamie McBain and the 35th pick to Buffalo for Andrej Sekera. 6:18- Fucale Watch: Carolina, Edmonton and New Jersey picks are approaching. 6:16- Tampa Bay selects Adam Erne from Quebec of the QMJHL. 33rd overall. Erne had fallen quite a bit. 6:10- The Second Round has begun. 5:50- Fucale continues to fall. Calgary, Dallas, Florida, Carolina and Edmonton are probably the best options for him at this point. 5:45- Columbus should seriously think about drafting Zack Fucale. 5:38- The draft sheet has officially gone out the window. Teams are reaching for players right and left. Zack Fucale is still on the board. 5:36- The Canadiens say something in French and a player walks on stage. 5:29- The Canucks select Hunter Shinkaruk 24th overall. He should have come off the board much earlier than now. 5:22- The Washington Capitals select Andre Burakovsky. LW from Malmo of Swedish league. Underwhelming to say the least… Wouldn’t be surprised if he’s wearing a Predators uniform next year. 5:18- The Capitals are on the clock. 4:57- It’s safe to say the San Jose Sharks have made 2 bad trades today. They select Mirco Muller 18th overall. He was projected as a 2nd round pick at best. 4:51- The Senators select Curtis Lazar 17th overall. Ottawa continues to add complete game forwards to their prospect list. 4:46- The Buffalo Sabres select Nikita Zadorov 16th overall. He had to come off the board at some point. Really surprised that he fell that far. 4:42- NYI selects Ryan Pulock from the Brandon Wheat Kings 15th overall. 4:34- Columbus selects Alexander Wennberg 14th overall. This is Columbus’ 1st of 3 1st round picks. 4:28- Winnipeg reaches for Josh Morrissey at #13. Zadorov would have been the safer pick. 4:21- Phoenix selects Max Domi 12th overall. Love the pick. We were hoping he would fall to the Capitals but we all knew that wasn’t going to happen. 4:17- The Flyers select Sam Morin at #11. Could be a reach at #11. 4:10- The Dallas Stars select Valeri Nichushkin 10th overall. Hopefully they won’t trade him at the trade deadline. Get it? Because they trade everyone at the trade deadline. 4:04- The Vancouver Canucks select Bo Horvat 9th overall. The trade ends up being Bo Horvat for Cory Schneider. 3:51- the Buffalo Sabres select Rasmus Ristolainen 8th overall. 3:46- TRADE– the Islanders have acquired the rights to Cal Clutterbuck from the Minnesota Wild for Nino Niederreiter. 3:45- It would make sense for Edmonton to pick Darnell Nurse here since they are young at the forward position. 3:40- Calgary selects Sean Monahan 6th overall. We really like the pick. If you’re going to blow up the team and rebuild you have to draft right guys. 3:31- Looks like Carolina isn’t going to trade out of the 5th pick. 3:22- The Tampa Bay Lightning select Jonathan Drouin 3rd overall. Drouin and Stamkos is a scary combo. 3:19- The Panthers prove once again why they are the Florida Panthers. 3:16- The Florida Panthers select Alexander Barkov from Finland 2nd overall. 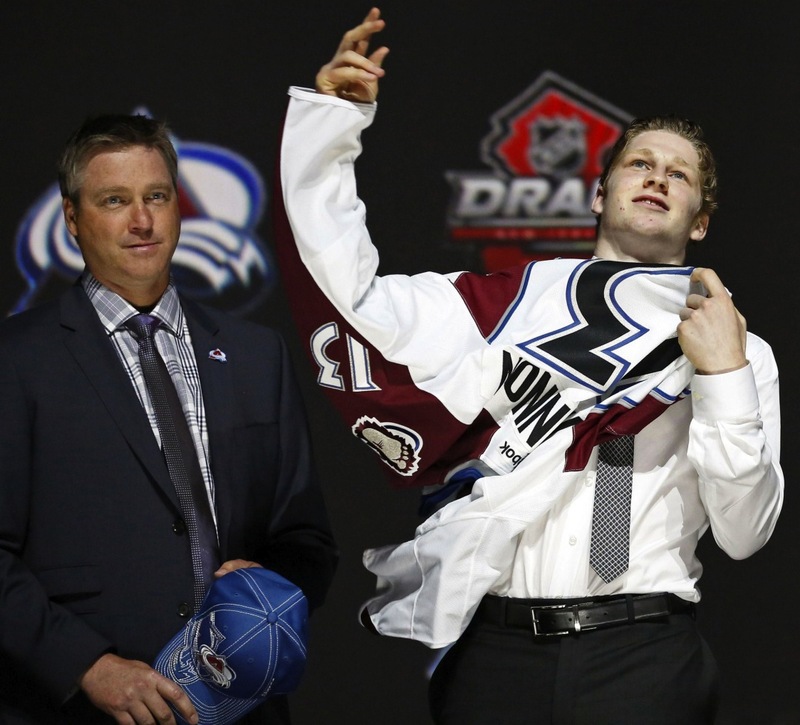 3:11- With the 1st Overall pick the Colorado Avalanche selected Nathan MacKinnon. 3:07- Rightfully so, Gary Bettman takes the stage to a stadium full of boos. 3:02- Colorado is on the clock: I have to think that they take Nathan MacKinnon here.